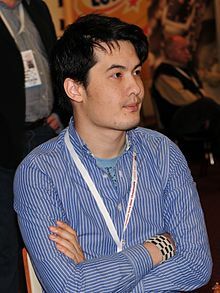 David Wei Liang Howell (born 14 November 1990) is an English chess grandmaster and British champion in 2009, 2013 and 2014. He is the youngest chess Grandmaster in the United Kingdom, a title he earned when he came second during the 35th Rilton Cup in Stockholm on 5 January 2007 when he was 16. The previous record holder, Luke McShane, was six months older when he became a grandmaster. Howell was born in Eastbourne to Angeline (originally from Singapore) and Martin Howell. He has a younger sister and lives with his family in Seaford, East Sussex. He has been playing chess since the age of five years and eight months, following his father's purchase of a second-hand chess set at a jumble sale. Howell quickly learned to defeat his father and soon came to the attention of the Sussex Junior Chess Association, where he received tuition from a number of established county players. He progressed rapidly and became the British Under-8, Under-9 and Under-10 chess champion. In August 1999, Howell became famous internationally when he broke the world record for the youngest player to have defeated a Grandmaster in an official game. He defeated GM John Nunn in a blitz game at the Mind Sports Olympiad. Howell still holds this record. He is also the youngest player in the world to have qualified to compete in a national chess championship, taking part in the British Chess Championship in August 2000. He came fourth in the Player of the Year ballot held by the British Chess Federation during 2000. In 2001, Howell came joint first in the European Under-12 Chess Championship and joint second in the World Under-12 Championship. In the Hastings Challengers tournament in January 2001, Howell became the youngest ever British player to defeat a grandmaster at classical time controls when he beat GM Colin McNab. His chess coaching with grandmaster Glenn Flear was sponsored by JEB (Hove) Ltd, the software developer responsible for the BITEM event management website. There were also training sessions with Nigel Short who has worked with other successful juniors such as Pendyala Harikrishna, Sergey Karjakin and Parimarjan Negi. He obtained the three necessary GM norms between 2004 and 2007; these comprised the 4NCL team tournament (season 2004/5), the CCA-ICC International at New York 2005 and Stockholm's Rilton Cup 2006/7. His results included wins against GMs Tomi Nyback, Slavko Cicak, Vladimir Epishin, Daniel Fridman and Nick de Firmian. Since becoming a grandmaster in 2007, Howell has participated in a variety of competitions; he took a share of fourth place in the British Chess Championship that year and went on to scoop the English Chess Federation's Player of the Year Award. A significant rise in his Elo rating followed his achievements of 2008, beginning with victory at the Andorra Open, where he scored an 8/9, ahead of experienced grandmasters Julio Granda Zuniga and Mihail Marin. He followed this with a share of third place at the World Junior Chess Championship in Gaziantep, where he was always challenging for the lead. At the very strong EU Individual Open Chess Championship in Liverpool he finished with a share of fifth place despite a surprising loss on time and then went on to win the annual Winterthur Masters event, ahead of other grandmasters that included former Paraguayan champion Axel Bachmann and former Swiss champions Joseph Gallagher and Florian Jenni. At the Dresden Olympiad of 2008, he joined the England team on board 3 and contributed 7½/11 for a tournament performance rating (TPR) of 2675. Howell was the British Rapidplay Chess Champion in 2008 with a score of 10/11 points, and in 2009 with 9/11. He tied for first with Andrei Istrăţescu, Romain Edouard and Mark Hebden in the 2009/10 Hastings International Chess Congress. He placed third in the London Chess Classic in December 2009. He won the British Rapidplay Chess Championship again in 2010 with a score of 10½/11. In 2012 Howell won the Leiden Chess Tournament. In August 2013 Howell won his second British championship title with 9½/11. The following year he shared first place with Jonathan Hawkins in the 101st British Chess Championship. Howell took clear second place at the 2015 Gibraltar Masters tournament with 8/10, half point behind Hikaru Nakamura. In December 2015, Howell won the inaugural British Knockout Championship, held alongside the 7th London Chess Classic, by defeating in the final Nicholas Pert 4-2. In the FIDE rating list for August 2015 he reached a rating of 2712 and thus joined the ranks of the 2700+ players for the first time.